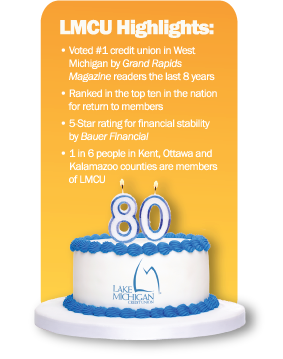 News from LMCU: LMCU is celebrating 80 years! LMCU is celebrating 80 years! In October of 1933, founder Lloyd F. Hutt began building something very special. He opened the doors of his home and created the Grand Rapids Teachers Credit Union. Pooling the funds of 13 enterprising teachers, thus began a legacy of true community banking that will soon reach the 80-year mark. access to their funds 24/7/365. As a non-profit organization, LMCU is based on the principle of always acting in the best interests of its members. And as a member, you are very much a part of that success. With your foundation of support, we have become West Michigan’s largest locally headquartered financial institution. You are the reason we’re celebrating. Naturally, we have some big plans in the works to celebrate this 80-year milestone, so watch for details in upcoming newsletters. This is going to be fun!